Little Sparta welcomes visitors in June, July, August and September each year, respecting Finlay’s intention that the garden should be experienced when the trees and plants, all integral to the artwork, are in full leaf. See detailed information on the right. Travelling by car, Little Sparta is approximately one hour from both Edinburgh and Glasgow. Directions and Satnav advice are available here. There are no direct public transport links to Little Sparta. The nearest bus stop is in Dolphinton (for the 101/102 Edinburgh – Dumfries service), some 4 miles from the garden. Our recommendation is to take the bus to West Linton and meet a pre-booked taxi there. Bus Trips to Little Sparta – awaiting 2019 update! Buses will leave from the Scottish Poetry Library on the first Saturday in June, July and September 2018 and every Saturday during August 2018. The buses will depart promptly at 11.30am from the lane behind the Scottish Poetry Library. Further information and how to book. From the car park, access to the garden is via a 10 minute walk along a farm track. Please call at reception to purchase admission and receive further information before entering the garden. A selection of books and guides are available to buy at reception. Allow at least 90 minutes to explore the garden fully. Please wear sensible shoes and dress appropriately for the weather on the day. There are no picnic areas in the garden and refreshments are not available (please bring a bottle of water if the weather is hot). A public toilet is accessed via the Kailyard. Parents/guardians are asked to ensure children do not climb on the artworks in the garden. All ponds and streams are unfenced and paths can be slippy when raining. Only assistance dogs are allowed. Please note, the walk from Little Sparta’s car park to the garden is uphill and approximately 700m long via a stony farm track. This walk is not suitable for those with breathing or walking difficulties. It is possible, strictly by prior arrangement, for private cars to drive directly to the garden and park in one of the limited number of spaces available. A mobility scooter is now also available for the use of visitors with special access needs. The garden plan showing the route suitable for the mobility scooter is available here. Please contact Laura Robertson for further information and to book car park space and the mobility scooter. Little Sparta in its entirety is protected by copyright. Visitors may take photographs or video for their own private use or study. 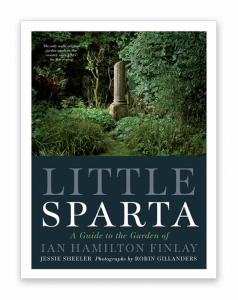 No images of Little Sparta may be published or broadcast without prior permission from the Estate of Ian Hamilton Finlay and its executor Pia Simig. Please contact Wild Hawthorn Press for further information. We also accept the BBC Gardeners’ World 2-for-1 discount card. These are available on Thursday and Friday afternoons only, for an additional fee of £50 per group. There is a minimum fee of £130 for visits outwith our published open hours. Please contact Laura Robertson for further information. Please download this PDF for detailed driving directions to Little Sparta.